Candice saved this hideous old lamp from a bulldozer (literally) and for the last year and a bit we’ve had it hanging up in our basement for extra ambient lighting. The light was setup only to be turned off/on by pulling/placing the plug and that part’s so sketch that we rarely use the thing. 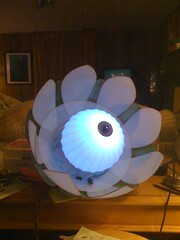 So when it came time to replace a bulb, I decided to use a HypnoOrb instead of a more typical bulb. 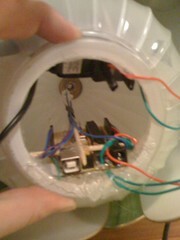 Essentially what I did was very carefully solder wires on to the light socket and connected them to a power adapter. The power adapter was then connected in to one of my Arduino boards programmed with the HypnoOrb code, though slightly modified to respond a little nicer to the potentiometer input. 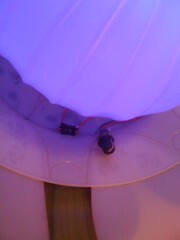 I of course had to also hook up an RGB LED to the whole deal and I goofed with that for awhile. I ultimately decided to try using this whole setup with no resistors on the LEDs. 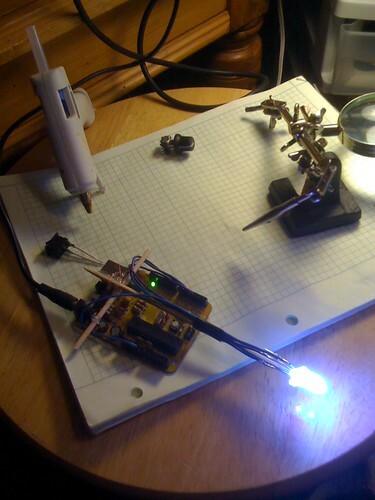 Now, normally you should never do that as if you don’t limit the current through a diode with a resistor, you could (more like definitely will) burn out the LED. But I knew that for some reason with the Arduino that doesn’t seem to happen. Anyway, this time I opted to leave the resistor out for maximum brightness. A couple of hours, some solder and a TON of hot glue later, It’s all come together rather perfectly. Bamboo Skewers were key in providing a little needed structure and of course much electrical tape and some soldering filled in the gaps. I also added a little off-on switch and latched on a potentiometer to set varying speeds of operation. You can Get the code from here. For other HypnoOrb specific stuff, check out the project page here.